Our AC / DC fans are available in a large range of models to fit every application. We carry micro fans for miniature cooling applications, as well as larger, standard sizes. Engineered for optimum performance, they have a long service life and excellent energy efficiency. They also operate quietly, and deliver consistent, reliable results. The value-added features from Pelonis Technologies provide even more benefits to our customers. For example, we use a unique design for our AC fans that increases airflow while protecting the fan from overheating at high temperatures. The design also integrates built-in locked rotor protection, rotation detection and tachometer to increase the longevity of the fan and decrease the risk of failure. In addition to these features, our fans are tested for quality to ensure the best possible performance. Our quality control staff is highly trained to perform stringent testing procedures. They are well-acquainted with the industry standards and ensure that our fans comply with all the relevant requirements. With over 1000 fans in stock, we are certain to have a fan that meets your requirements. Offering a selection that includes axial, centrifugal, inline duct, and cross flow fans, our RoHS compliant products are found throughout the automotive, medical, and HVAC industries. 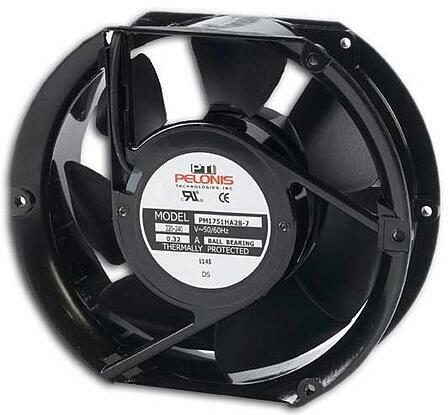 Pelonis Technologies has years of experience manufacturing innovative, high-quality fans for industrial applications. We provide our customers with unparalleled service and expertise, in addition to a wide range of products. With so many available options and models to choose from, the benefits of selecting a Pelonis Technologies fan are obvious.